A personalised glass tumbler makes the perfect gift for a groom to be to enjoy a drink before the big day! 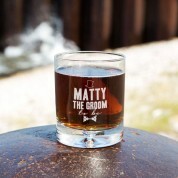 Our quality glass is carefully engraved by our professionals, with a stylish design. 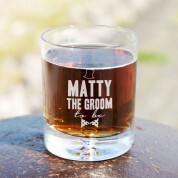 It reads the recipient's name and “the groom to be” in complimentary bold and scripted fonts. It is made complete with an outline of a top hat at the top and a bow tie at the bottom. 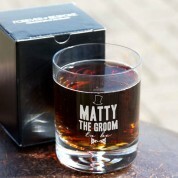 We think this would make a great gift from the stags or best men! We laser engrave the glass in house, to ensure the best quality is delivered to the customer.